– An old-school trend worth reviving: Double disc wheels. You can’t tell me a Zipp 808 front is meaningfully more stable than a disc. And something about a front disc makes you look so committed to the art of time trialing. – Another tantalizing old-school trend: Booze on the bike. Friday afternoon beers at work have led to who-knows-how-many prophecies of weekend bike greatness? The euphoria of well-timed Shiner Bocks is something I’d love to feel mid-ride, rather than the night before. Epic feats I’ve envisioned then never seen through: Plans for a record-breaking Saturday afternoon of hill repeats; the race we’ll drive to at 6am tomorrow; the architecturally-divine start house we’ll build so we can put on a local TT series; the Sunday 5 hour ride; the heartfelt smacktalk whose origins can only be massive self-belief. The likelihood of any of this materializing -- how it lessens with every step closer to home. It’s only liquid courage if courageous acts, in fact, occur. It’s time for a change: Something new will be in my bidon in the crit on Tuesday night. – I should’ve cared more about the Dauphiné than I did. I must confess I don’t know anyone who kept tabs on it. How long will this Giro hangover last? It’s time to tune into France, yes I know, and I’ll start with this photo of the cross of iron after which the Col is named. – FYI we’re now present & accounted for on Facebook, proving my mother’s worst fear true -- if all of my friends jump off a cliff, I’ll do it too. I’m unsure what we’re supposed to be doing there, but we’ll get it figured out soon enough. Keep your eyes peeled for some Facebook-only promo codes soon. Being that we’re newbies, by the way, if other companies are doing things you dig, don’t hesitate to give us tips. We’re teachable! – Loveliest team bike paint of all time? 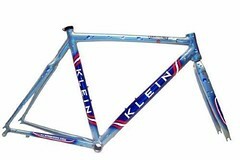 It might’ve been the turn-of-the-century Klein frames ridden by Gerolsteiner. The chlorinated-pool blue paint with frizzante bubbles splashing throughout made them near-lickable. Klein’s fall from prominence was so steep & fast it’s easy to forget what a cult-favorite brand they once were. And it’s easy to forget, too, that Lemond isn’t the only brand Trek drove into the ground. Looking back at the decade of Gerolsteiner in the pro peloton, the question isn’t whether the team was rogue’s gallery for its whole lifespan (consider the bookends: in 2002 they starred René Haselbacher & Davide Rebellin, while in 2007/8 they had David Kopp, Schumi, and Bernhard Kohl). The question, rather, is what early 2000’s team, in retrospect, doesn’t look equally shady? For some reason I’m a little sentimental about them -- in a way I can’t get for, say, Saunier Duval or ONCE. Maybe it’s a legacy of those beautiful, bubbly bikes? – It’s rare that a race flyer can put a big smile on your face, but this flyer for the KS State RR Championship did it for me. For the racer kids poor in everything except fitness & desire, the Northeast HS Gym is a godsend. And for those of us with enough dough to pay for a hotel -- it’s a reminder of the way things used to be, pre-dough. The Tailwind Cycling Club of KS gets my vote for club of the year. – The greatest American retail bike shop that ever was: City Cycle of San Francisco when Clay Mankin was still with us. He was the original visionary about 2 bike retail commandments we now all take for granted: (1) A bike shop focused on high-end product can financially flourish. (2) A bike shop focused on fit creates loyalty because of the rare expertise & customer service inherent to counseling customers on good bike fit. Clay was doing this a decade before it became de rigueur, and most amazingly he preached his high-end, fit-centric approach to anyone in the bike business who’d listen. He had a magic retail formula and he was eager to share it. My interactions with him -- mostly as a customer when I was punk, post-college bike racer, then later as the ambitious owner of a small bike shop -- were meaningful in shaping what Competitive Cyclist is today. Clay passed away in November 2005. The tragedy was manifold, and one of its eventual impacts was the decline in prominence of City Cycle. Part of it was because so many metropolitan bike retailers (in San Francisco and elsewhere) emulated the City Cycle model. Part of it, too, was because Clay was gone and he was more than the proprietor of the store -- he was its soul. Rumors galore spread for years about the eventual direction of the shop -- I once heard Specialized was plotting to buy it to make it a flagship store; another time I heard key City Cycle employees got to a flashpoint with Clay’s widow (i.e. sell it to us, or we’ll walk); and more than once I daydreamed (see Shiner Bock, above) about making an offer to buy it to establish the first Competitive Cyclist boutique brick & mortar store. This week, apparently, City Cycle was acquired by a new ownership group. Though we know none of the players, we wish them the well in re-energizing a classic brand in American bike retail. The standard they’ll need to meet is almost impossibly high. But they bought a reservoir of good will and heritage, and they’re in the perfect location. We’re rooting for them. – Lastly, many have already heard the tragic news that Jim Douglas of Zipp died unexpectedly last week. He’d been with Zipp since 2002, and he was widely loved for his passion & knowledge for the brand, and for his warm & easygoing approach to pretty much everything. A lot of people will really miss him. One important detail that wasn’t widely circulated is that there is a fund now in place for his 9-month old daughter Annabelle. It’s the Annabelle Briar Douglas Fund, c/o The State Bank of Lizton, PO Box 96, Brownsburg, IN 46112.